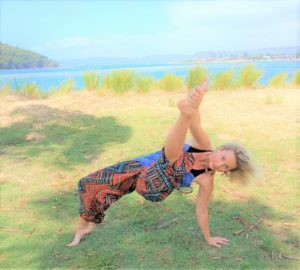 In this 2 hour class style workshop we will explore the fusion of traditional asana with creative movement/dance. Experience moving with both strength and flexibility – the meeting point between the yin and the yang. Learn to trust your intuition and listen to your body as you give permission for your soul light to shine through the quality of your movements. Feel the sublime grace and lightness of soaring like a bird or fluidly moving through water. Tap into and express the joy and spontaneity of your inner child through this divine play of movement. Honor and express the divine feminine. In this workshop we will explore Pranayama assisting you to tap into your own divine internal rhythm, arm balances synchronized in flow, playful transitions and exercises to help you understand how the mind body connection affects the way you move. The Asanas are a gateway to deepening your connection to your spirit. It is my intention to assist you to tap into that divine inner wisdom and portal of creativity so that it may feel free and unlimited in its expression. If you love music, movement and creativity this workshop is for you. Some prior dance or yoga experience would be helpful yet not essential as modifications will be given for all.